This Grilled Tomato, Mozzarella, and Pesto Sandwich Recipe is HANDS DOWN amazing!! 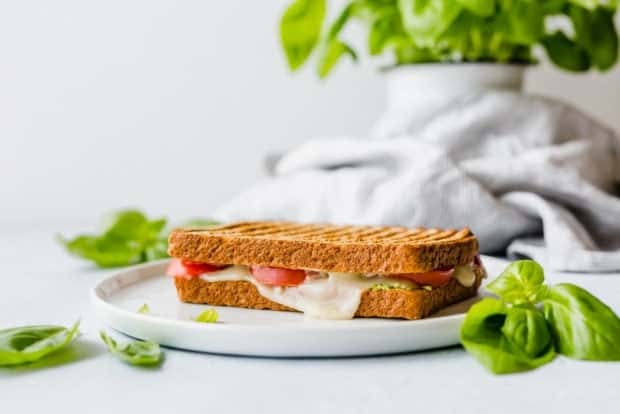 The basil pesto, mayo, and tomatoes offer a juicy flavorful sandwich! 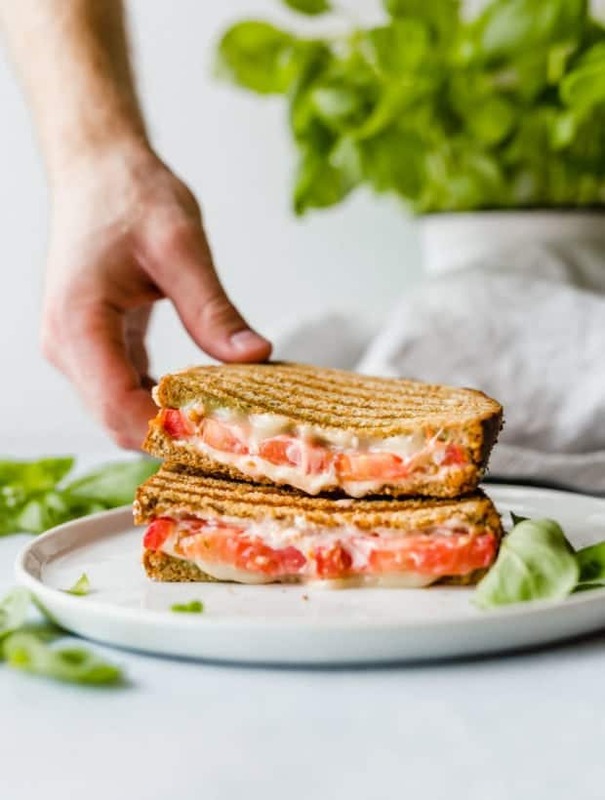 Make this tomato sandwich for lunch or dinner. Kids and adults gobble this right up! 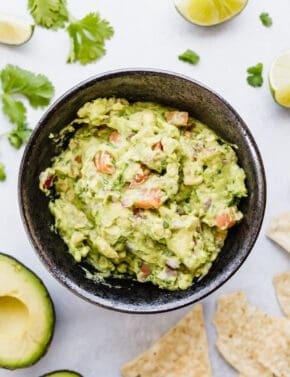 This has to be one of the easiest “recipes” I’ve posted. Making a pesto sandwich isn’t rocket science. But nonetheless, I will treat it as such and explain how to make THE BEST Grilled Tomato, Mozzarella, and Pesto Sandwich! Cut two slices of bread, I opted to use whole wheat bread because this is what we usually have on hand. Slather one side of bread with mayo, and the other with basil pesto. Grill on a panini press. I linked the one we own, I use it ALL the time! Meat sandwiches, grilled cheese, grilled tomato, mozzarella, and pesto sandwiches to name a few. If you don’t own a panini press, you can warm up a skillet on your stovetop and grill your sandwich via thought route. 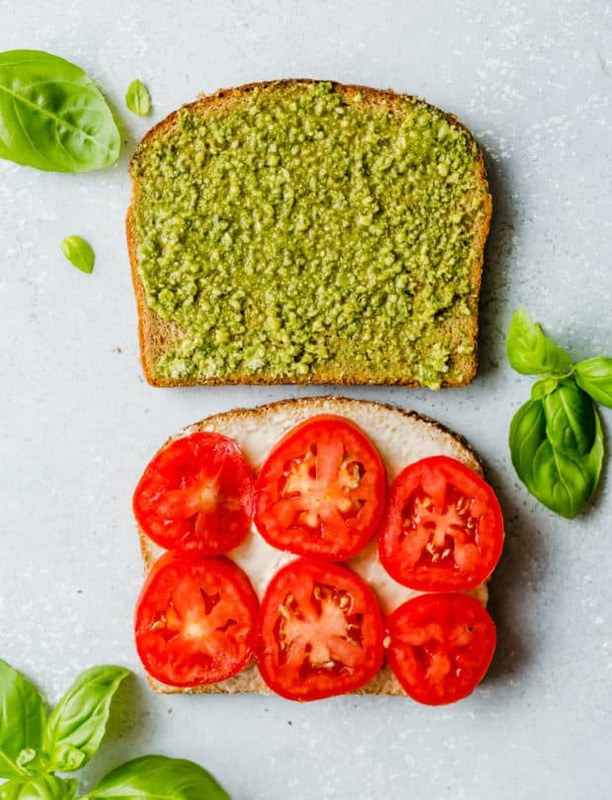 Do you need to use homemade basil pesto to make a pesto sandwich? No. Homemade basil pesto isn’t necessary. I LOVE homemade pesto, but unless you have a green house with a large basil plant, chances are you don’t have homemade basil on hand during the winter months. However, if you’d like to give homemade pesto a shot, I have a great recipe right here. Basil pesto is easy to make and it tastes delicious! How much mozzarella should I use when making a tomato sandwich? I use anywhere from 1.5-2 oz of sliced mozzarella on each sandwich I make. 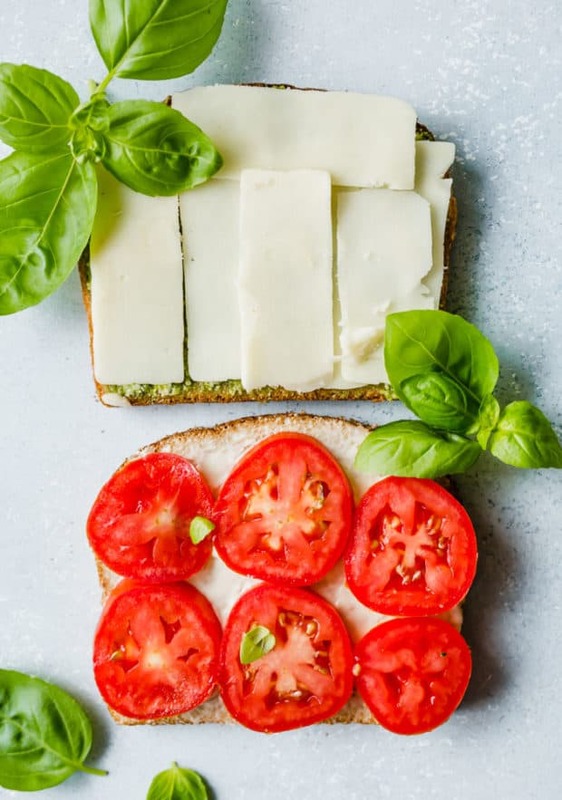 Once you see how much or how little 2 oz of cheese appears, you might opt for adding a touch more mozzarella on your sandwich, or slightly less. But 2 oz has proved to be my families sweet spot. 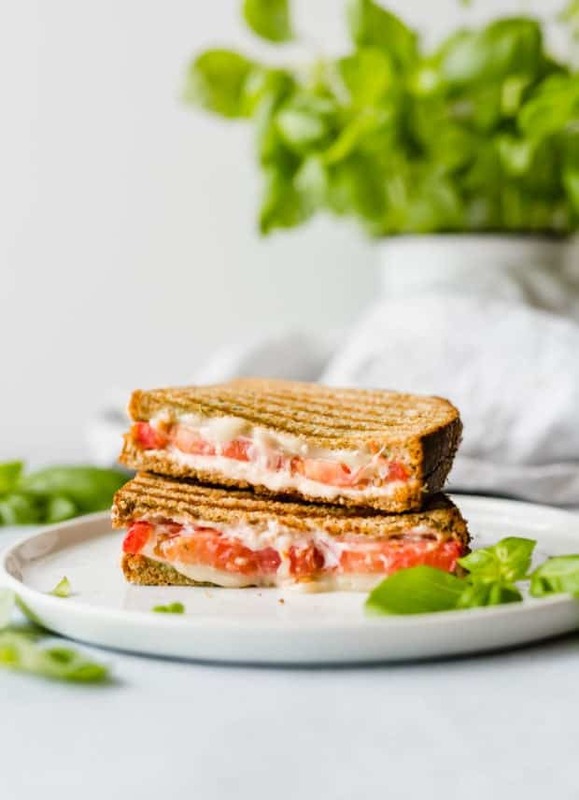 This grilled tomato, mozzarella, and pesto sandwich recipe is perfect to have on hand as these spring and summer months approach! This sandwich is healthy, filling, refreshing, and SO GOOD! 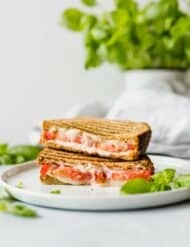 If you make this fresh tomato sandwich or any other recipe on my site, please come back and comment! I LOVE hearing from you! This pesto sandwich is so easy to make and it tastes AMAZING! We eat this for lunch on a regular basis! 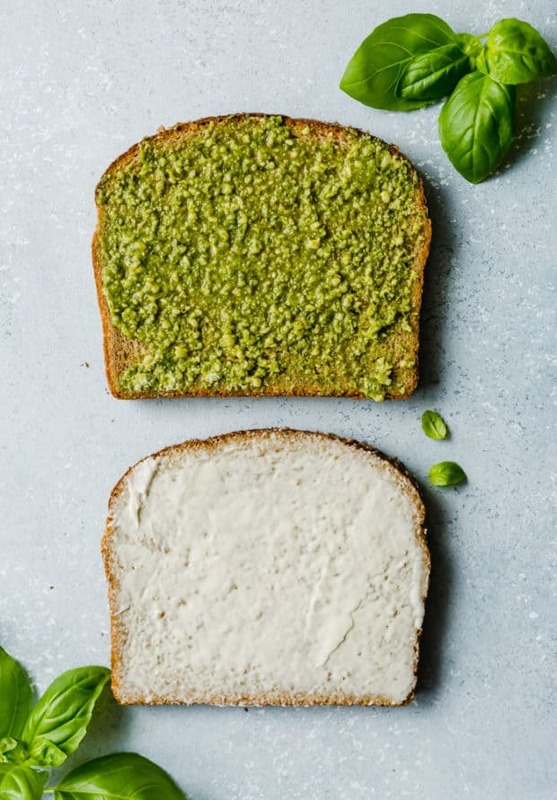 Spread the pesto on one slice of bread. Spread the mayonnaise on the other slice of bread. Place the tomatoes on the bread until the bread has been covered. Lightly salt the tomatoes. Place the slices of mozzarella on the tomatoes. Place the slice of bread with the pesto overtop the mozzarella and tomatoes. Place your sandwich on a panini maker until all sides are crisp and golden brown. If you don't have a panini maker you can warm up a skillet on your stovetop and grill your sandwich that way. Here is my homemade Basil Pesto recipe. Yum! I can’t wait for summer tomatoes! Simple ingredients that result in a phenomenal sandwich! Been eating this for lunch the past few days and love it!! I’m going to try adding sprouts to my next sandwich to switch things up a bit. These sandwiches were so yummy and easy! I used store bought pesto, which I didn’t love. Next time I’ll try the home made version. We made this when a friend from out of town stayed over — and she loved it! She asked for seconds and then half of a third! Also, we didn’t have a panini maker and just used a George Forman grill with excellent results. I also buttered the outside of the bread, grilled cheese style, for extra flavor and crispy goodness. Genius idea using the George Forman! I’ve made these sandwiches at least three times and enjoyed the flavor and ease in making them! 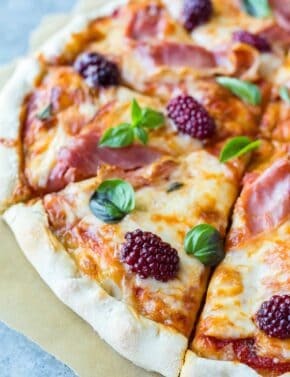 I had something similar in Europe so it was nice to find this recipe! Gail, so glad to hear you enjoyed this recipe!